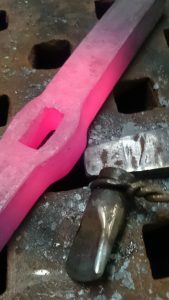 After a complete refresh of the site and the addition of the blog its beginning to feel like a new start at our Blacksmiths forge! At the moment we have some nice commissions that are almost complete and some really interesting ones that are ready to start. I’ll be posting some of the work we’ve done recently as well as current work we are involved with. blacksmit hing techniques we use as well as some of the tooling we make to achieve those techniques. This year we are showing at Art in the Pen in Thirsk as well as Skipton. We will also be doing our usual agricultural shows as well, so its going to be a very busy year. We are also planning to work on some sculptures I’ve been thinking about for quite some time now. My sketch pads are filling up with lots of work I realy want to do, it feels like I’m back at art college again, which is a great feeling. Please do follow our blog and also our social media pages as well.